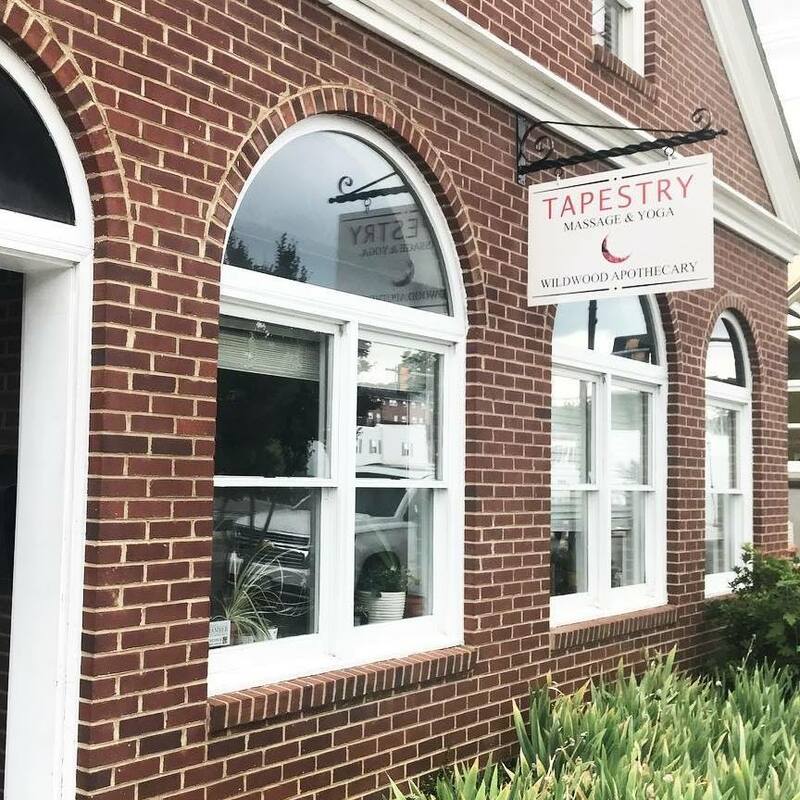 Tapestry Massage & Yoga and Wildwood Apothecary is a sanctuary for personal healing and your local source for a healthy body, mind and spirit. We provide massage sessions by NOURISH, public and private yoga classes, a full herbal apothecary, Yoga and herbal workshops, Reiki energy healing sessions and host The Wild Woman Project © Circles. Much like threads in a Tapestry we strive to weave together and offer these healing modalities to best support you on your journey to a more vibrant, connected, and healthy lifestyle. Cassandra is a practicing herbalist, yogini, Reiki practitioner, and co-owner of Tapestry Massage & Yoga and Wildwood Apothecary. Her mission in life is to learn to expand into what is unknown with mindfulness and presence. Too often do we allow our mind to get in the way of experiencing each and every moment. She aims to teach yoga from a place of compassion, vulnerability and playfulness where others feel welcomed and free to be themselves, where ever they are at that day. Every day is different, changing and cyclical. Honoring such cycles and rhythms can inspire more compassion for ones self and yoga practice. Her teaching philosophy encompasses the ideas of the 8 limbs of yoga with a focus to help students feel comfortable in their bodies, to help them explore their breath and inner being. Yoga is much more than the postures known as Asana. The practice of Asana is just the tip of the iceberg. It is her hope that each student feels safe and comfortable where they honor themselves wherever they are at in the present moment. Cassandra's goal is to try to share yoga in a way that is approachable for every body. She enjoys weaving in yoga philosophy, the Chakras, occasional essential oils and hands on assists into her classes. She has received her 200 hour Yoga Alliance approved teacher training with Satsang Yoga in 2016 and is continuing her 300 hour training with Anna Pittman at the Breathing Space. She has always had a love for plants and the earth and has been studying herbs for over 10 years. She has studied with Twin Star Herbal Education and herbalist and yogi Judy Apicella. She is also an avid gardener and a voice for native plant life. With an environmental studies degree, she has held positions as a landscaper, gardener, naturalist, botanist and educator. Cassandra loves the healing arts and also practices Reiki, an energetic healing modality. She has her Reiki II certification from Ginny Mackles, who created The Reiki Journey Meditation Album in the traditional Usui Shikoku Reiki Ryoho method. Cassandra likes to refer to herself as a wild woman and is a trained Wild Woman Project circle leader. She leads new moon circles once a month with The Wild Woman Project. She hopes to cultivate a tribe of women who feel supported by each other and can follow their intuition to be the best version of their authentic self. Cassandra, originally from the Hudson Valley, New York lives in Blacksburg, VA with her husband, Jason who supports her wild inclinations and cat, Luna. I love exploring the alleys & trails of this town and cultivating connections throughout our community. I feel best when I engage in many diverse activities, physically challenging my body & creatively challenging my mind/spirit. All of the art & photos I use are my own (unless noted). I like to step out of my comfort zone, let it expand, and step out again. Massage and yoga together are powerful practices that bring emotional and physical confidence. A strong body is a strong mind and a flexible/open body is an open mind, and we thrive when we have both. I view my role as being one that empowers you in your own body. As a part of my yoga practice I practice non-judgment. This doesn't mean that I'm perfect, but it does mean that I will approach you and the privilege of working with your body with respect. I studied at Blue Ridge School of Massage & Yoga and have since taken many continuing education courses. I am trained in Ashtanga Vinyasa Krama Yoga by Jeff Tiebout, a natural leader whom I can't thank enough for giving me the seeds to grow my own wilderness of love, knowledge, confidence, and acceptance. Yoga is a life study and practice that is part of me daily. My prenatal training comes from Claire Marie Miller, an inspiring woman who teaches from years of education and experience in pre/postnatal health. One of the most valuable lessons I took away from her training is that motherhood care is a powerful way of shaping our future. Babies who are nurtured as early as the womb will carry that with them throughout life. I am involved in the Fifth Vital Sign and hold free community classes on menstrual health. These classes shed light on the cycle of fertility & infertility that we can come to depend on if we take the time to get to know ourselves. I am fascinated by this work and seek out more knowledge and understanding every day through books, interviews, videos, relationships, etc. My clients have become my greatest teachers and I have you to thank for that. Street parking is available in front of the building and there is also a public parking lot behind the building before 6:00pm.